The Woman’s Health Pavilion’s serves women from Middle Village at our nearby Forest Hills location. We offer a complete range of OB-GYN services in Queens including well-woman care, birth control services, treatment for STDs/STIs and other acute conditions, and prenatal care. When you see us, there’s no need to go elsewhere for routine lab work or ultrasound services; we have it all right here in our office. To visit our Forest Hills location and meet with an experienced obstetrics and gynecology specialist, request an appointment using our online form or by calling (718) 263-1963. We offer same-day appointments for urgent conditions and can even see you on evenings and Saturdays. Monday – Thursday: 8 a.m. to 8 p.m.
Metered parking is available on the street. There is a commercial parking lot on 71st Avenue just north of Queens Boulevard. 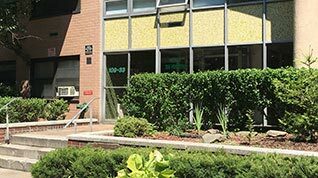 Our Forest Hills OBGYN office, just steps from Middle Village, is located just north of Queens Boulevard, across from the United Artists Midway Theater. We are located on the second floor of the Forestal Condominium building, which is located on 71st Road, between Queens Boulevard and 110th Street. Our team includes doctors, nurse practitioners, physician assistants, and midwives who are all dedicated to the health and wellbeing of women. We all look forward to serving you with the highest level of care and consideration. From Middle Village, take Furmanville Avenue to Woodhaven Boulevard. You will see St. John’s Cemetery on your right. Turn right onto Woodhaven Boulevard. Turn left onto 66th Avenue. Cross Alderton Street. 66th Avenue becomes Fleet Street. Turn left onto Yellowstone Boulevard. Cross over Queens Boulevard. Yellowstone Boulevard becomes Jewel Avenue. Continue on Jewel Avenue and turn right onto 110 Street. Cross 71st Avenue and take the next right onto 71st Road. The Forestal Condominium is located on the right side, in the middle portion of the block, between 110th Street and Queens Boulevard. We are at 109-33 71st Road in Suite 2G. Ring the buzzer for entry.